The Aquarium sea otter research team works closely with government agencies and partner institutions to collect deceased otters, too. Sea otter carcasses recovered on beaches are valuable to researchers because findings from a necropsy—an animal autopsy—can help piece together not only the story of each individual sea otter’s life, but also the larger issues facing the population as a whole. 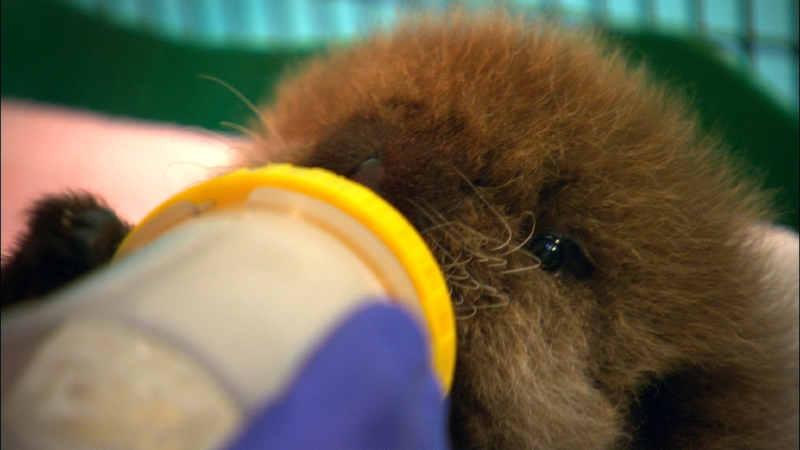 By the early 2000s—about the time the Aquarium began refining its innovative sea otter surrogacy program—Teri realized she and her colleagues had amassed a significant dataset on live-stranded otters. “We looked at all the data and were blown away,” she says. The team determined that human-related threats to sea otters had dramatically declined over time and today account for less than five percent of all strandings. 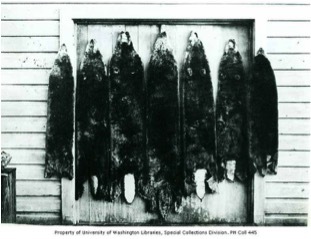 Before commercial hunting began, population estimates for sea otters around the Pacific Rim ranged from 150,000 to 300,000 animals. At the start of the 20th century, only a few thousand survived. In California, they were thought to be extinct until a tiny colony was discovered in the 1930s along a remote section of the Big Sur coast. But what about other threats, like predators or food scarcity? Within their core range in California, where sea otter population growth is largely limited by food availability, more than 63 percent of all strandings are strongly related to crowding. The researchers expected this, because although the sea otter population has increased, its geographic range has not expanded to match. Ten years ago, however, researchers could never have suspected that a new and different kind of challenge would someday threaten sea otters. Aquarium researchers determined that the absence of significant kelp canopy coverage at the peripheries of the sea otter range, especially in waters north of Santa Cruz and south of Point Conception, can inhibit sea otters’ ability to reproduce and survive. Without sufficient kelp canopy cover, sea otters, especially reproductive females and their pups, can be left vulnerable to shark bites—a multi-faceted problem that might also reflect a shift in the predatory behavior of sharks from open ocean to nearshore coastal waters. So how much kelp is enough? According to the study’s findings, nearshore habitat with at least 10 percent kelp canopy cover provides sea otters with significant protection—but more would be better. Kelp cover along the Central Coast has diminished in recent years—a transformation that can be linked most significantly to a 2013 outbreak of sea star wasting disease. The epidemic caused urchin-eating sea stars to wither and die. Absent their main predators, sea urchin numbers skyrocketed. 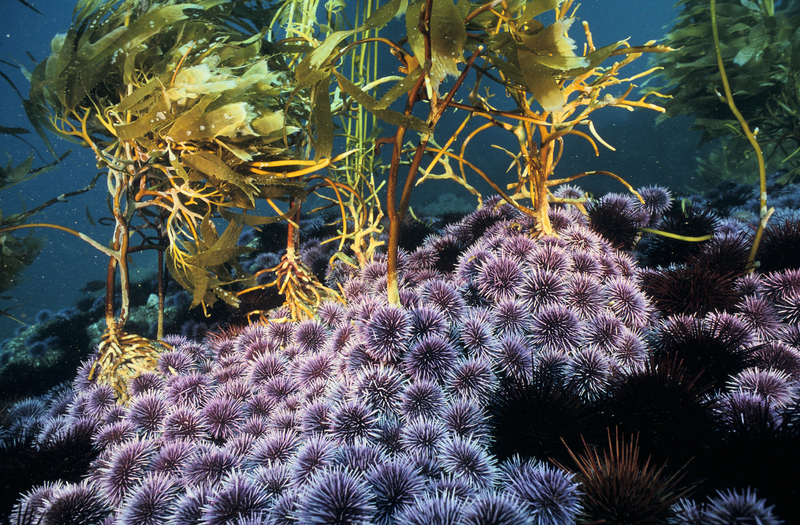 Left unchecked, urchins consume large quantities of kelp unabated, destroying once-vibrant kelp forests, leaving behind extensive “urchin barrens”. “Otters can only eat so many urchins,” says Teri. “And within large urchin barrens, many of the urchins may become undernourished and therefore unappetizing to the otters. 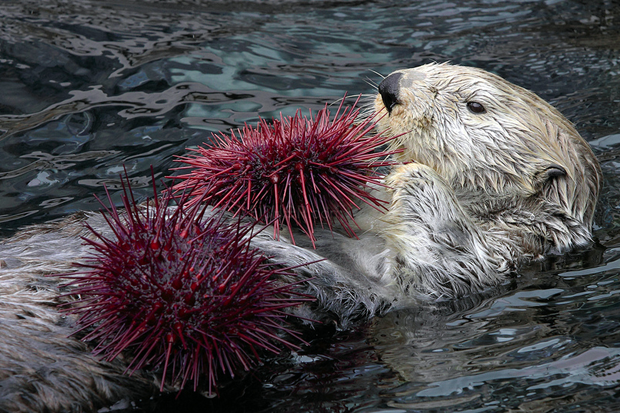 “So while we know sea otters can enhance kelp growth by eating urchins, they cannot make kelp grow in habitat that’s unsuitable for its survival,” says Teri. In the wake of these findings, new questions arise: Will sea otters be able to expand back into their historical range without human assistance? 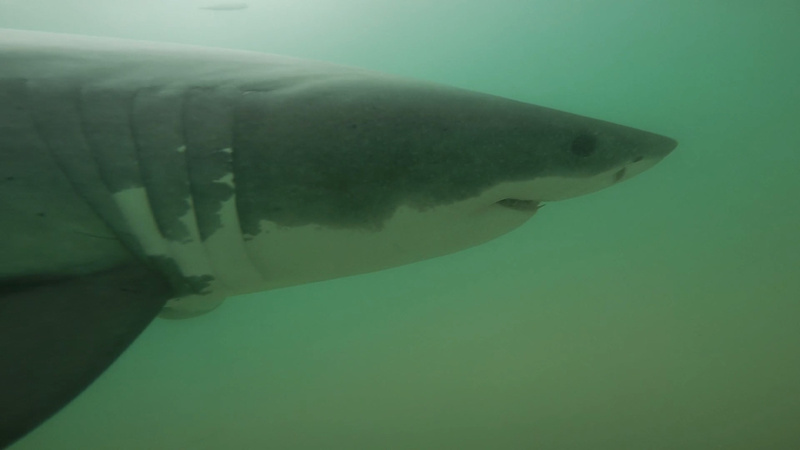 And, if they do move beyond the limits of their current range, will there be enough kelp to give them protective cover from inquisitive—and hungry—sharks? 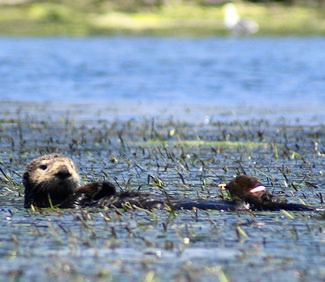 Healthy populations of sea otters contribute to coastal ecosystem resilience, in kelp forests and in estuaries like Elkhorn Slough, where they help eelgrass to thrive. Photo by Ron Eby. 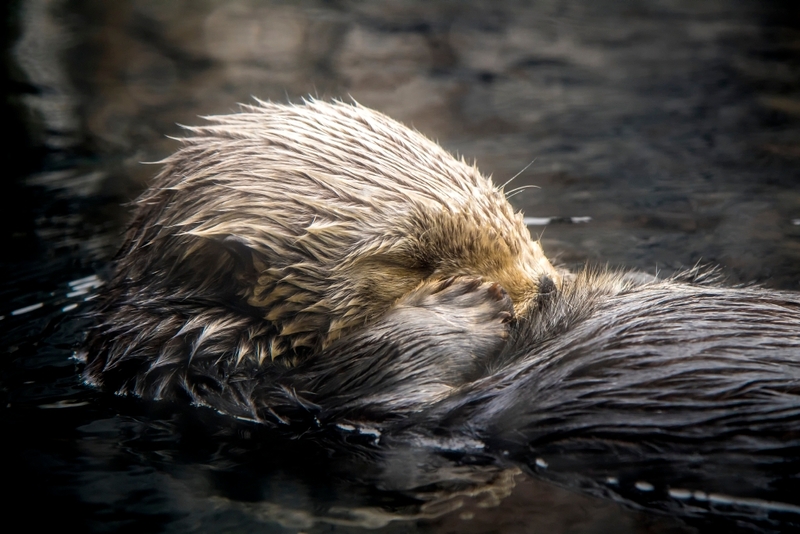 Because sea otters are known to be powerful ecosystem engineers—in kelp forests and in coastal wetlands—part of the Aquarium’s conservation strategy for building resilient coastal ecosystems has focused on sea otter recovery. This includes, eventually, facilitating their expansion back into their historical territory. Because of the Aquarium’s surrogacy program, the only one of its kind to rear and release orphaned sea otters pups, researchers can physically place animals where they might be most needed. In recent years, the wetlands of Elkhorn Slough have benefited from this approach, to the point where roughly 60 percent of all sea otters currently in the slough are graduates from the Aquarium’s surrogacy program or descendants of those animals. Teri folds her hands together and smiles as she reflects on her nearly 25 years of sea otter research. “For years people have been looking at us asking, ‘What good are you guys doing with these stranded animals?’” she says. “Finally we can say that this work can benefit the sea otter population by helping reestablish these animals in local or regional areas. We now have insights, data and a program that can provide a solid scientific foundation to inform new thinking about how we might reintroduce sea otters into areas where they haven’t roamed for more than a century. In my novel, Rogue Wave, set on the Monterey Peninsula, there’s one scene where a Great White attacks a mother otter and my protagonist, a sea otter biologist at the aquarium, rescues her baby. Thank you for the work you’re doing. In the last 6 weeks the entire back side of San Nicolas Island has been denuded of kelp by a fin-fish trapper. I witnessed this happening. With the kelp gone from most of the island, ONE man stole any chance you had at restoring an otter population at that island! Congratulations on acquiring his license fee–hope you put it to good use! LIVID!